Pancakes are one of those comfort foods that everyone loves. So now that we’re eating less gluten and grains, I thought it would be fun to try coconut flour pancakes, especially since there seems to be such strong opinions about what makes a great coconut flour pancake. Well, in my humble opinion, the fluffier (and fruiter) the pancake, the better. And after making way too many batches, I’ve found that the key to fluffy coconut flour pancakes is two things: Separate your eggs, so you can fold well-whipped, fluffy egg whites into the batter, and keep the pancakes small – silver dollar size to be exact. So if you enjoy the flavor and texture of coconut flour, we think you’ll find these pancakes quite tasty, especially with fresh organic blueberries added. They’re also delicious with fresh diced organic strawberries, or diced banana with a sprinkling of crispy walnuts. Mmm! Just see note below about how to properly add fruit to pancakes. Enjoy! Whipping the egg whites is key to fluffy coconut flour pancakes! Adding fruit directly to the top of each cooking pancake (rather than adding it to the batter) ensures that the pancakes cook through evenly. Preheat griddle over medium to medium-low heat. In a small bowl combine the coconut flour, baking soda, salt and pinch of ground cinnamon. Place the egg yolks in a large bowl and whisk in the melted butter. (Be sure the melted butter has cooled to touch before adding, otherwise you may end up with some cooked egg-yolk bits.) Next, whisk in the maple syrup (or honey), vanilla, coconut milk and apple cider vinegar. 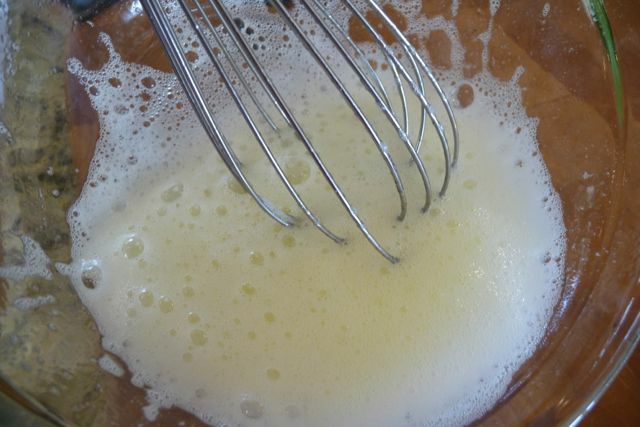 Then, use the whisk to fold the whipped egg whites into the batter; by gently turning the batter over and over again, until well combined. Allow batter to sit about 3-5 minutes for coconut flour to absorb the liquid. Note: Batter should be somewhat thick. But if batter is too thick for your liking, add additional milk 1 tablespoon at a time until desired consistency is reached. 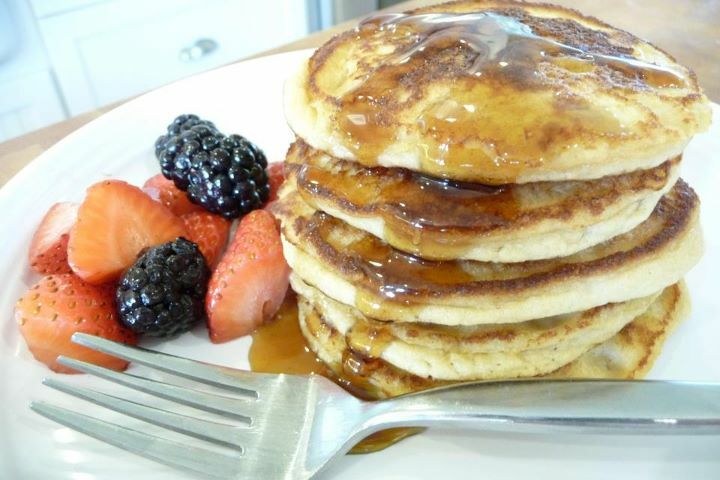 Serve hot off the griddle with butter, pure maple syrup and a medley of fresh berries. Fabulous Fruity Pancakes: To make fabulous fruity pancakes, do not add fruit directly into the pancake batter. 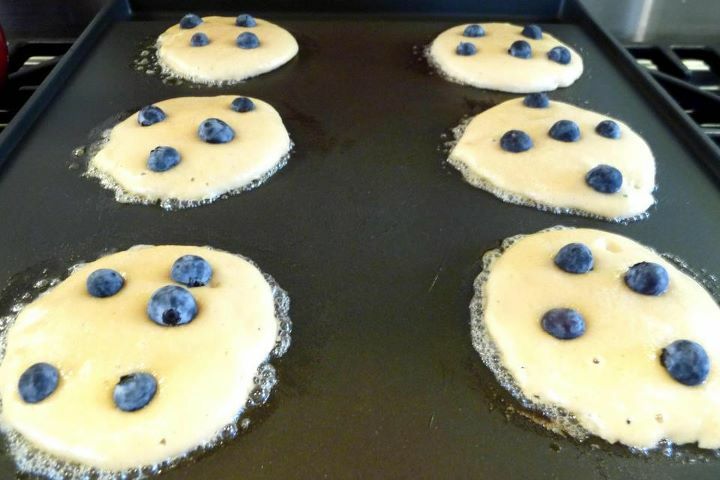 Instead, once you ladle out the batter onto the hot griddle, add a small amount of fresh whole blueberries (or other diced fruit of your choice) to the top of each pancake prior to flipping (see photo above). This ensures that the pancakes cook through evenly. It's also best to use fresh fruit, since frozen fruit tends to be excessively moist and may result in a soggy pancake. *Disclosure: If you opt to purchase using the affiliate links in this post, a small portion of the sale goes to support The Nourishing Home at no additional cost to you. There is no obligation to purchase, but if you do, you are helping to support the free resources, meal plans and recipes here at The Nourishing Home. Thank you! How many calories in a serving? What’s the serving size? Well, I love all your recipes so much that I thought I’d try this one too. Your advice about silver dollar size is right on, this makes it much easier to flip. You should also caution that if you try to flip too soon then the pancake will fall apart (speaking from personal experience). The taste was different, not what I expected….maybe the yogurt or the coconut flour as this is my first venture with it. While I probably won’t make this one again especially given all the dishes it created, I will say the little ones really liked them and gobbled them right up. Thanks for all the creative recipes you continue to provide. I prepared this panckaes today,I didn’t want to follow the tip of adding the fruit after you flip once so it was a little harder to turn the pancakes, but they tasted very good, specially to my husband since he doesn’t like to eat bread or anything that taste or looks like it, but he loves coconut so he gave it a try and he love it! Thanks for your recipes and for this website. I was looking for a website like this and I found it! Thaks again. God Bless. I just tried your coconut recipe today because I’m out of almond meal. I actually found the taste reminded me of french toast (a rarity in our GF household). 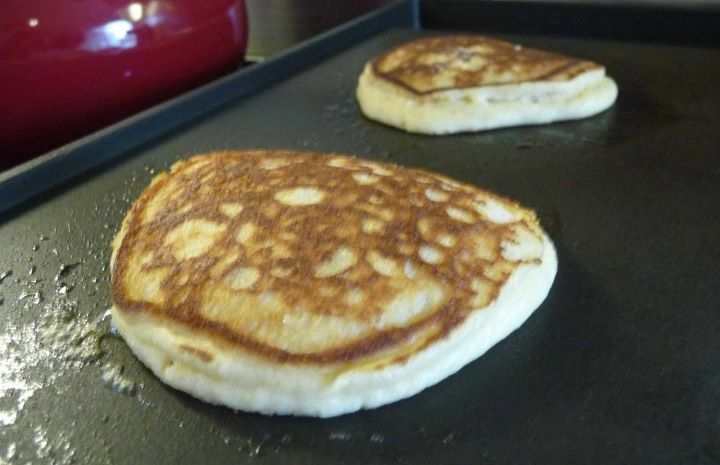 The smaller size, full browning and greased griddle are definitely helpful for flipping. I also found that the pancakes were fluffed up nicely until I flipped them, then they dropped. These still tasted alright and we have a couple leftover for tomorrow’s breakfast. I absolutely love your meal plans and have downloaded the spreadsheet. Thanks so much for making that available. It is really necessary to be organized and prepared when you can’t (and don’t want to) eat anything that comes out of a box. I’m glad I have your site as a resource. Thanks for the time you put into it! I made your fluffy almond flour pancakes last week and enjoyed them, so I was hesitant to try these. I have to say that I like these coconut flour ones better. The only change I made was to use whole fat greek yogurt (as you suggested) as I didn’t have milk kefir on hand. I made 20 pancakes which ends up being 200 calories for four pancakes. Can I sub either full fat buttermilk or heavy cream for kefir in this recipe? 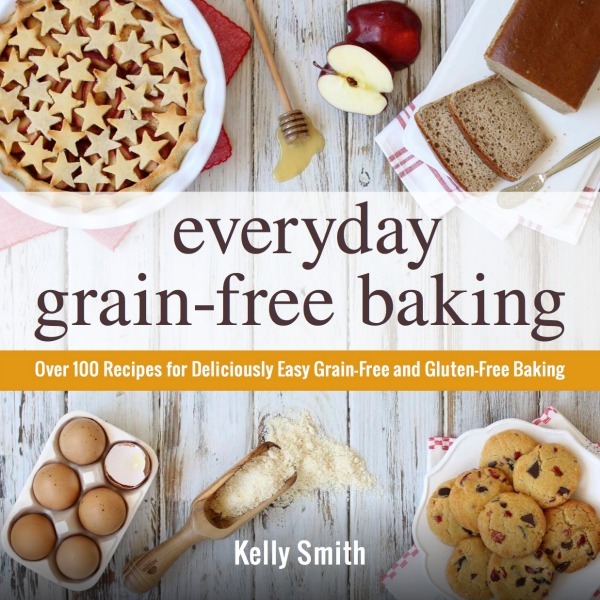 I think I am missing where the kefir or yogurt or buttermilk is used in the recipe. Where does it go and how much? Hey Kelly! Thanks so much for your website- it’s a huge help as I’m fairly new to cooking for my allergy toddler. Question- has anyone made these using chia gel eggs as a sub for eggs? We have egg allergy here.